I am still stuttering along looking for a new home. I almost bought MLB: The Show (I love baseball and it has been a few years). I almost bought Horizon: Zero Dawn based off of Blognation recommendations. I almost bought Ghost Recon: Wildlands with it being a top seller and in a third party shooter mood. In the end of it all none of them jumped out to me as a ‘MUST PLAY NOW’ title and I decided to reload a game I didn’t get to finishing – The Division. 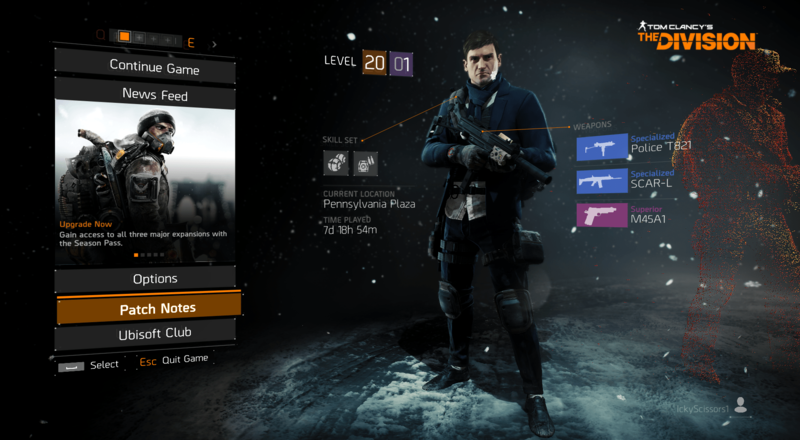 I have three posts about The Division, one that uses an example of their ’emergent’ game play (2014) that made me question where new features come from – player demand, or designer curiosity. The second (2014) was questioning why they would want to compare themselves to Destiny (and subsequently failed as a comparison to Destiny, now in real time) and the third was when I was actually playing it – a year ago (2016) and what was holding me back from loving the game. Until I get a really hard motivation to play something in particular, this is what I am going to try. Logging in shows that I am level 20 with almost 18 hours played. (Not sure where that picture gets 7D, 18H played – the outside menu says 18H. I have not played 7 days…) It also shows I am 61% through the main story line so I already have my main goal established. It will be nice to finish that. I remember fondly enjoying the main story arc but quickly reminded that The Division suffers from “that game that would be awesome as a single player game but need to make it multiplayer for a check mark and future revenue sources so will make it less good to fit that mold” immediately. The skinny of it is that an outbreak hits New York, and you are a part of a deep, undercover network of operatives who only get activated when all other support systems break down. It is a great premise. The types of things you get to do is clear out gangs, rescue hostages, support groups such as the police and JTF, re-establish services such as power (etc.) – all the while trying to solve who started the outbreak (and why). See? Told you it is a very cool premise. It falls short on two main areas. The first is the forced multiplayer element. They have a nice map of New York. As we clear out parts of the city and support the Military and Police, those areas should stay “safer”, unless the various groups and gangs of criminals make a deliberate push. Working through “rescuing” parts of New York until the entire city is saved as you solve the mystery could be an award winning narrative. Instead, roaming gangs “repop” right outside your base every 5 minutes. It’s a waste of a setting. The second is the gear grind / bullet sponge effect. I am level 20 with blue and purple gear. (Simply saying there is blue and purple gear makes everyone reading right now understand the rarity quality. That is issue one right away). As a level 20 in decent gear, I went straight to the next story mission which has level 20 enemies. Level appropriate content with a fast travel option – hurray! I did half relatively smoothly and then hit a “boss” battle. The boss had 2 higher level henchmen with her. One took me over 400 bullets to take down. If you build your entire game around a modern day premise then that needs to match up. I don’t care if you are wearing a bullet proof vest, there is not a bullet proof vest on the market that can take 400 bullets from an assault rifle at close range, (plus 4 grenades, did I mention that?) before taking a guy down. That suspension of disbelief is at levels of ridiculousness. Once again, showhorning in RPG and MMO mechanics into an otherwise great game has a ruining effect. The way to “win” these battles isn’t to be tactical or a good shot. It is to unload a clip / use cooldowns (yes, cooldowns.) retreat far enough to reload clip, reset cooldowns, heal up. Unload. Run away. Unload. I almost ended up at the beginning of the map to take the guy down. Once he was down, I now have to run all the way back through the map to get to the end again to properly exit and “win” the instance/scenario. How that is supposed to be fun as a tactic is beyond me. The key is to greatly out level the content. In order to do that you have to hit all the side missions, etc. which isn’t so bad. But the pacing is horrible. Absolutely dreadful. But yeah, I can stomach that for 39 more %. I think. Guarantee I am skipping all the DLC though. You can judge me for being that upset about the ridiculousness about it all but still want to play. There is a lot of good here. The graphics are great. The menus and information settings are very “alternate reality” and super cool. The setting is captured wonderfully. As you can tell from the pictures above, there are some really graphic moments but New York definitely feels under siege and I have a purpose in game. The gear upgrades and clothing options are fun. Modding out a weapon is fun and useful. I love the clothing options (chose a suit with a scarf – all of that is customizeable with things you find in the world). The regular gunplay and gameplay is fun, things are just broken on boss battles / “epic” enemies (which just shouldn’t exist). In Destiny I get it (aliens, monsters, etc.). In The Division you are just shooting humans, some of which may be monsters in actions only. The stories have been great (from tracking down other missing agents, to learning how the outbreak virus was distributed to the population, it’s all very good and I am connected to the world and the well-being of the people there). I hear Ghost Recon: Wildlands keeps much of what is good about The Division but bakes in more realistic enemies, and I hope I am not wrong on that. In the meantime I am going to give The Division a bit more time and attention unless it is able to turn myself off of it completely. Solving the outbreak will come down to my willpower to battle bad design decisions, which in itself may be harder than saving New York. Yeah, I think you’d like Wildlands more for several reasons. 1) There’s loads of clothing options and you can have multiple sets saved that can be switched at any time (say if you want to really get into the setting and have dark clothes for forest areas and desert camo for sandy areas). 2) The gear grind is non-existent because the guns and gun parts are always found in the same places. You can get the best sniper rifle right off the bat if you know where to look, but it’s not better in an unrealistic way (enemies are only slightly easier to kill). 3) The bosses aren’t bullet sponges. They might have a little more health than regular enemies but most of the challenge comes from that fact that they might be in a small room with 5 guys wielding assault rifles and grenades and oh yeah, there’s a mounted machine gun in the corner for them to use. It’s definitely more of a tactical game; even regular enemies can kill you if you run into enough of them or are caught unaware. Sneaking around, sniping, and retreating when needed make up the majority of the tactics. Wildlands does have cooldowns but you have to unlock them through side missions and they have long timers so you might only use one or two during a fight, if at all. From what I’ve seen though, The Division has a much superior story. Taking down drug lords is okay but helping New Yorkers after an outbreak is so much more interesting. I’d eventually like to play The Division just for the story but if they used the Wildlands mechanics in The Division, I think the game would have been amazing. Except maybe the side missions, those are kind of repetitive and boring after a while. The side missions in the Division actually work pretty well. From taking out a small gang hideout, to protecting supplies before they can been collected by the JTF, to taking out named gang members, rescuing hostages, etc. They are just mired in the issue that the supplies never actually leave. And then sometime in the future they are “at risk” again. I am fine with having the bigger missions replayable and in groups, but The Division built as a strong single player narrative with multiplayer instances/scenarios, etc. would have made it a far better title all around. Even the base building aspect is well done (you add features such as Canine units, a pharmacy, etc. as you free up parts of the city and rescue key personnel). Bullet sponge issue aside, I am going to finish the single player base campaign. It’s already purchased and I am interested enough – and 10 minutes of a bad bass fight ever few hours doesn’t completely take away the good parts. I don;t mind the cooldowns if they are meaningful but in The Division they are encounter tuned, meaning you need to use them frequently and to full effect to win the boss battle. I’ll wait for Ghost Recon to go on sale, but it is definitely on my to-buy list. I haven’t played for about a year now, so I missed the major update that rebalanced max level. So grain of salt. I enjoyed the story/leveling experience all the way to cap. The group missions were quick to join, and felt like you needed to be organized to complete. Some sponges, though mostly it was about applying the right tactics. Skills back then had no real effect, aside from healing and buff/debuff. It was quite a fun ride. Max level was a different matter, and totally turned me off the game. Most of that has changed now (so I hear).